James Luther Adams lived in Cambridge, Massachusetts just across from the Harvard Divinity School, where he began teaching in 1956, following his 20 years of teaching in Chicago. I first met JLA when I was a student in the College of the University of Chicago, and he was Professor of Religious Ethics and head of the Department of Ethics and Society at the University of Chicago. That initial meeting occurred when he spoke at Channing Club, the Sunday evening university student gathering at the First Unitarian Church of Chicago on the edge of the campus. His theme that evening was dramatically expressed in a provocative pamphlet published by the American Unitarian Association, On Being Human—the Liberal Way. Intrigued by JLA’s presentation of central working principles of liberal religion, I later met with him when I was exploring study at Harvard Divinity School, which he had attended before he became a parish minister in Salem and then Wellesley Hills, Massachusetts. Since Adams knew Dean Willard L. Sperry, he volunteered to write to him on my behalf. Then, after an invaluable year at Harvard studying religion, philosophy and sociology, I returned to Chicago for study with Adams and other members of the University of Chicago faculty. At the same time that I was in theological school, I was the Director of Student Work at the First Unitarian Church, and Adams was our Channing Club’s university faculty advisor. In 1950, when Dorothy and I were married at that church, Dr. Adams officiated. After our marriage, we lived in an apartment at Channing House, where the Adams family lived. 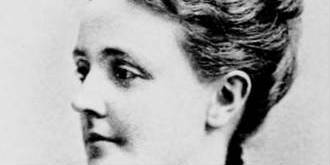 We thus informally got to know Jim’s wife, Margaret, as well as their three children: Eloise, Elaine (Miller), and Barbara Jane (Thompson). 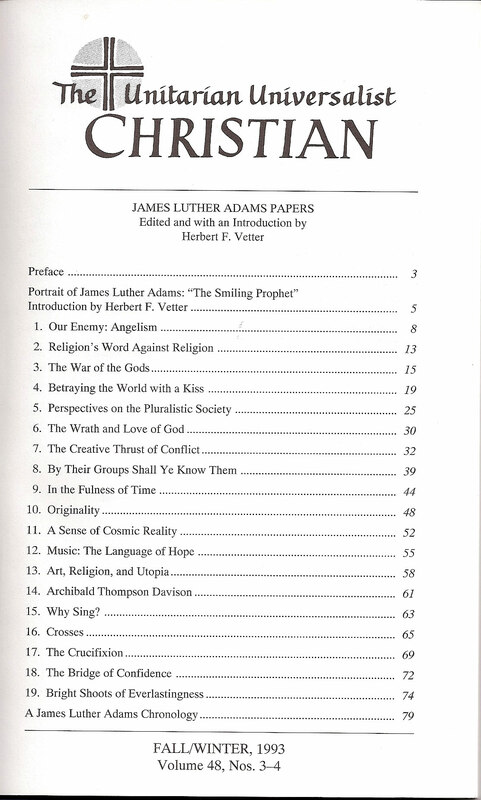 During my student years in Chicago, I read all of the James Luther Adams writings then available, including his doctoral dissertation on Paul Tillich’s Philosophy of Culture, Science, and Religion. I found that this deeply distinctive dissertation superbly supplemented the JLA translated essays and the JLA concluding essay in Paul Tillich’s The Protestant Era published by the University of Chicago Press in 1948. That Tillich book, which was put together by Adams, was classic enough to put Tillich, a refugee from Hitler Germany, into the very mainstream of American secular and religious thought. Viewed in this context, it seemed to me that JLA’s doctoral dissertation on Tillich also deserved to be published. A few years later Adams agreed to let me explore this possibility. When I contacted Melvin Arnold, the president of Harper and Company in New York, who had previously been the director of Beacon Press in Boston, he said he was interested, so we sent him the text. Harper was advised by a prominent scholar that they should not publish the book because Adams had more important things to do than to rework his doctoral dissertation for general publication. Melvin Arnold, who had worked closely with Jim during his Beacon Press years, invited me to present a case to Harper as to why they should publish this book. I argued that Tillich had already become—thanks to Professor Adams—a truly formative figure in American culture and that the Adams interpretation of Tillich’s early thought was simply indispensable for any adequate understanding of his thought. Fortunately, the book was published in 1965, and it sold so well that Harper later issued a paperbound edition. At the time the book on Tillich’s philosophy was published, Adams was teaching at the Harvard Divinity School, and my family and I were also living in Cambridge. For some two years the two of us met with some frequency to gather and evaluate papers he had written over the years in order to explore alternative ways of arranging them for publication by Beacon Press. This project finally came to fruition in 1976 when Max L. Stackhouse edited and significantly introduced On Being Human Religiously: Selected Essays in Religion and Society by James Luther Adams. That book, which was also later issued in paperback by Beacon, has now been supplemented by three more recent books of additional collected essays. Two of them, published by Beacon Press and edited by George K. Beach, are The Prophethood of All Believers (1986) and An Examined Faith: Social Context and Religious Commitment (1991). Both volumes have helpful biographical introductions. The third volume of JLA essays was edited by J. Ronald Engel, Voluntary Associations: Socio-cultural Analyses and Theological Interpretations (Exploration Press, 1986). Incidentally, the very first book of collected JLA essays, Taking Time Seriously, was edited by J. Bryan Allin and published by the Free Press in 1957. 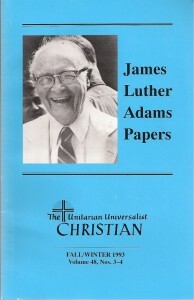 In addition to these publications, there was in 1977 a special double issue of The Unitarian Universalist Christian entitled James Luther Adams at 75. It was my privilege to serve as the guest editor and to introduce that collection of hitherto unpublished papers which included an autobiographical piece, “The Evolution of My Social Concern,” plus one essay for each decade of Jim’s professional career, beginning in the 1920s. The Unitarian Universalist Christian, Vol. 48, nos. 3-4, Table of Contents. “Our Enemy: Angelism” was a baccalaureate sermon delivered at the Rockefeller Memorial Chapel of the University of Chicago in 1944. “The War of the Gods” is drawn from a paper on “The Congregational Idea” co-authored with James Bissett Pratt of Williams College and presented at a pre-World War II Yale conference of Unitarians and Congregationalists. “Betraying the World with a Kiss” was delivered at Bond Chapel of the University of Chicago Divinity School in 1948. “Perspectives on the Pluralistic Society” was prepared for a conference on voluntary organizations at Loyola University, Chicago, 1974. “The Creative Thrust of Conflict” was delivered as a Unitarian Universalist Association General Assembly address at Miami, Florida in 1966. 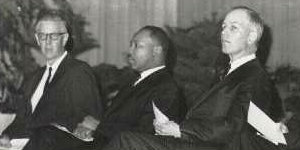 “By Their Groups Shall Ye Know Them” was a lecture at Baylor University in Waco, Texas around 1970. “In the Fullness of Time” was delivered at Bond Chapel in 1939. 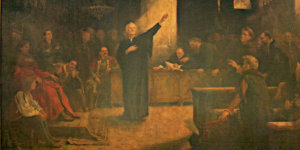 “Originality” was a sermon at the Second Unitarian Church in Salem, MA in 1926. “Music, the Language of Hope” (1971) and “Art, Religion, and Utopia” (1975) were delivered at the Arlington Street Church, Boston. “Archibald Thompson Davison” was delivered in memoriam at Andover Chapel, Harvard Divinity School, in 1961. “James Luther Adams: A Biographical and Intellectual Sketch” by Max L. Stackhouse in Voluntary Associations: Essays in Honor of James Luther Adams, edited by D. B. Robertson (John Knox Press, 1966). 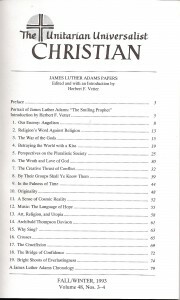 “James Luther Adams and the Unitarian Denomination” by George H. Williams in the Andover Newton Quarterly (January 1977). Note may also be made of other work that is now in process. 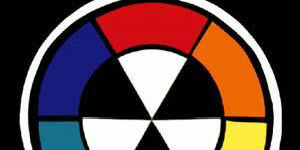 Under the sponsorship of the James Luther Adams Foundation, an autobiography of JLA is being completed. 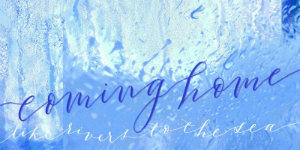 The title is Not Without Dust and Heat. Also, aided by a grant from the Lilly Foundation of Indianapolis, Indiana, Professor George Pickering of the University of Detroit, Mercy, has begun work on an intellectual biography of Adams. A major resource for this project is the JLA archives at the University of Syracuse, some 250 boxes of documents. 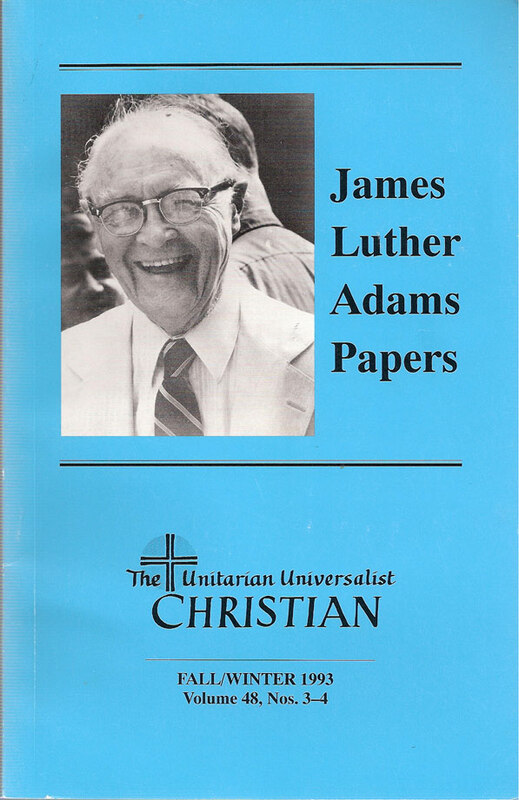 Here, then, is the context in which the Unitarian Universalist Christian shares with its readers these hitherto unpublished James Luther Adams Papers. 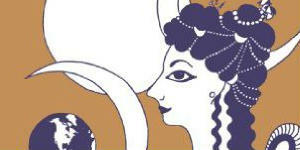 For more information about the UU Christian journal, click here. There is also information about Volume 48, nos. 3-4 about James Luther Adams.